The Sudan government has is under pressure by the same organisation that led the months long protest that led to the fall of the president Omar al-Bashir saying that they want the military government to give out power to a civilian government. The group decried the coming to power of the military saying that if the Sudanese government does not hand over power to a civilian government it would go on a 10 days long protest till her request and wish id granted. Witnesses said several army vehicles had surrounded the area and that troops were seen removing the barricades which demonstrators had put up as a security measure. The SPA has urged the military council “to immediately transfer power to a civilian government”. It said the resulting transitional government and the armed forces must bring to justice both Bashir and officials from his feared National Intelligence and Security Service. In a joint statement by their embassies on Sunday, they warned against any use of violence to break up the protests and said the “legitimate change” the Sudanese people demanded had not taken place. But in a press conference, the council’s spokesman did not respond to the protesters’ latest demands. He did, however, announce the appointment of a new NISS head after the intelligence agency’s chief Salih Ghosh resigned on Saturday. “Sudan’s courageous protesters need more than words: They need strong international action for real change to have a chance.” On Saturday, Burhan vowed to dismantle Bashir’s regime, lifting a night-time curfew with immediate effect. 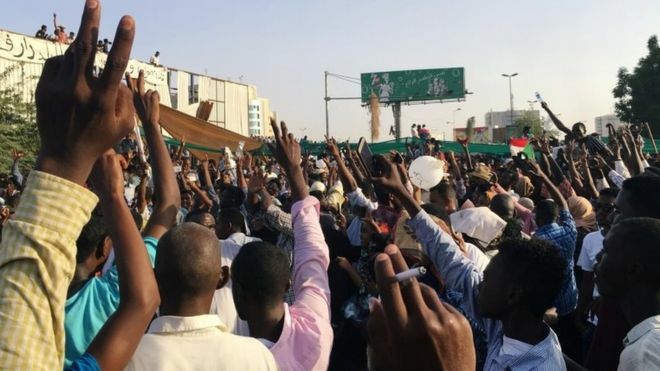 Tens of thousands of people have massed non-stop outside the army headquarters since April 6, initially urging the military to back their demand for Bashir’s removal. But his departure in a coup failed to satisfy the protesters, who have demanded justice for Bashir-era officials. The SPA has also called for the confiscation of properties belonging to the ousted president’s National Congress Party and the release of soldiers who sided with their movement. Late on Sunday, the military council said it has set up a committee to register NCP properties and seize control of them.